For years, people have talked about the Olmec "heartland" as a western Gulf Coast phenomenon anchored by the three major sites San Lorenzo, La Venta, and Tres Zapotes, all of which took their turn as the capital city. Archaeologists referred to Olmec sites outside this relatively small area as the "hinterland." In 2006, V. Garth Norman and I visited Pomona in Tabasco on the western bank of the Usumacinta. 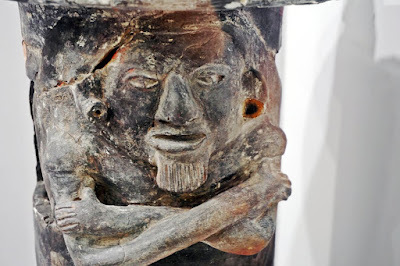 Pomona is generally considered a Classic Maya site, but we saw this monument on display in the INAH site museum. This photo does not do the monument justice. It is Olmec, about as Olmec as you get. Seeing this carving started me on a quest to map known Olmec sites. Until today, my map looked like this. Olmec influence reached into every part of Mesoamerica, but the culture core was still in the heartland, or so we thought. The 84th Annual Meeting of the Society for American Archaeology just concluded in Albuquerque, NM. My friend, Richard Terry, presented two papers at the conference on the soil chemistry of sites in Belize and Utah. Richard sent me abstracts of two papers presented by the dynamic team of Takeshi Inomata and Daniela Triadan, both from the University of Arizona. I wrote blog articles entitled "Takeshi Inomata" and "75 BC" describing some of their ground-breaking work at Ceibal and Aguateca. Inomata finished his Sabbatical year at Dumbarton Oaks (a research center in Washington, DC affiliated with Harvard University) and is now back in the field. What he and his team have found will re-write history and could have profound implications for the Book of Mormon. 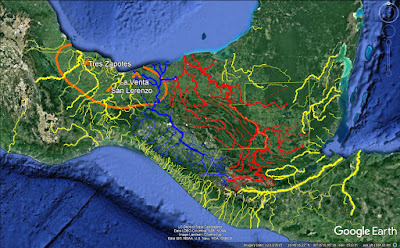 Since 2017, Inomata and Triadan have been excavating a massive Olmec site they named Aguada Fénix at the great bend of the San Pedro river in Balancán Municipality, Tabasco. This is near the large Maya trading site, Moral Reforma. It is the largest of 15 newly-discovered middle Preclassic sites in the area. 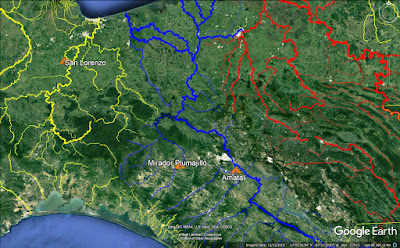 These 15 sites are so standardized in their rectangular layout Inomata and Triadan have coined the name "Middle Formative Usumacinta" (MFU) pattern to describe the site plans. Dates are coming in from 1,000 BC to 800 BC. Since Inomata is a master of precise dating, we can expect more clarity soon. It had an E Group, as did Ceibal in the middle Preclassic. It remains to be seen which predates the other. Prior to Aguada Fénix, the Ceibal E Group was the earliest known in Mesoamerica. It is so large it may have been the Olmec capital after the collapse of San Lorenzo and before the rise of La Venta. It had cultural ties with Ceibal, 185 air kilometers to the SE. Stay tuned. 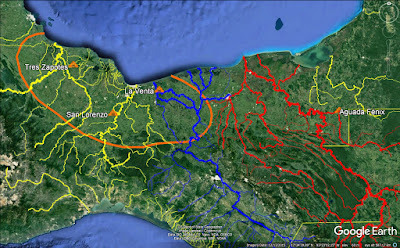 These 15 new sites headed by Aguada Fénix may force a re-evaluation of what constituted the Olmec heartland and may demonstrate a much closer connection between the Olmec and the early Maya than we have heretofore realized. They may also force us to re-think the proposed boundaries of the land northward during Jaredite times. 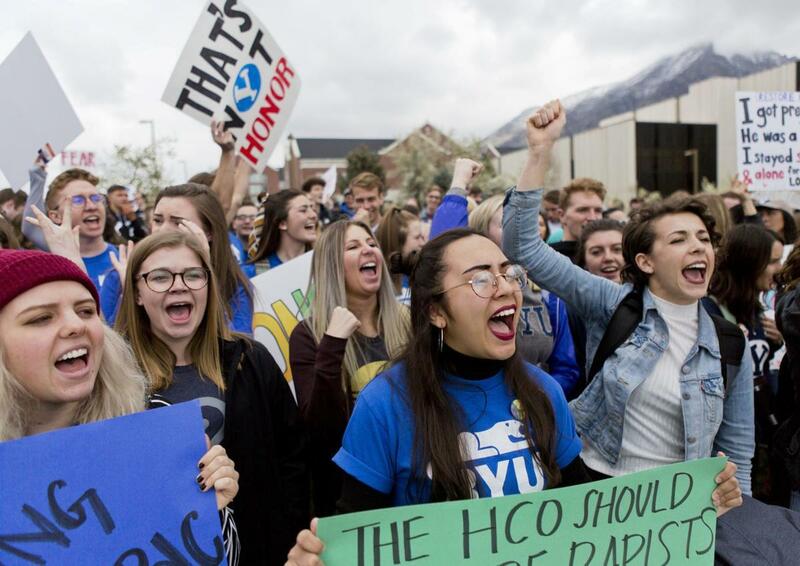 There was a demonstration at BYU on Friday, April 13, 2019, protesting the uneven way honor code violations are enforced. While serving as Bishop of the BYU 172nd Married Student Ward, I conducted many ecclesiastical endorsement interviews that included discussions about the honor code. On a few occasions, I had to work directly with the BYU Honor Code Office, and once I attended the training they offered to Bishops. I do not envy the BYU staffers tasked with enforcing this basic set of behavioral rules. If all the allegations brought forward by BYU students last week are factual, then there have been serious lapses and policy violations on the part of the honor code enforcement team. On the other hand, according to the young people I work with at Book of Moron Central, there is a growing sentiment, even among BYU students, that there simply should be no rules at all in today's hyper-tolerant, non-judgmental culture. The Church's April 4, 2019 policy change relaxing some rules for members in gay marriages and children of LGBT couples emboldened the BYU students to agitate for changes in the honor code via public social action. I entered BYU as a freshman in the fall of 1971. Men could not wear excessively long hair or beards, and women could wear dress pants but not jeans. By 1981 the no jeans rule for women was gone. BYU has tinkered with its dress and grooming standards over the years, but the honor code provisions about the Word of Wisdom, honesty, and chastity have been constants helping maintain the clean-cut, wholesome image the university is renowned for. Members of the Church need "to become stronger in a spiritually darkened world." "Our members are standing like a rock in a moving river." "Fortify our people - the adversary is an incorrigible insomniac. He never sleeps." Do not judge that which is evil to be of God. Do not judge that which is good and of God to be of the devil. The way to judge is as plain, that ye may know with a perfect knowledge, as the daylight is from the dark night. The Spirit of Christ is given to every man, that he may know good from evil. Every thing which inviteth to do good, and to persuade to believe in Christ, is sent by the power and gift of Christ. Ye may know with a perfect knowledge it is of God. Whatsoever thing persuadeth men to do evil, and believe not in Christ, and deny him, and serve not God, then ye may know with a perfect knowledge it is of the devil. After this manner doth the devil work. He persuadeth no man to do good, no, not one; neither do his angels; neither do they who subject themselves unto him. Ye know the light by which ye may judge, which light is the light of Christ. See that ye do not judge wrongfully. With that same judgment which ye judge ye shall also be judged. Search diligently in the light of Christ that ye may know good from evil. If ye will lay hold upon every good thing, and condemn it not, ye certainly will be a child of Christ. Good and evil exist and are as relevant today as they ever were. Some deeply-ingrained attitudes are cultural artifacts, not moral absolutes. The Book of Mormon offers clear and precise direction to distinguish eternal truths from passing fads. 2 Nephi 26:29-33 is unambiguous. There shall be no priestcrafts. Have charity, which charity is love, D&C 59:6. Do not murder, 6th of the 10 commandments, D&C 59:6. Do not lie, 9th of the 10 commandments. Do not steal, 8th of the 10 commandments, D&C 59:6. Do not take the name of the Lord God in vain, 3rd of the 10 commandments, D&C 59:5. Do not envy, 10th of the 10 commandments. Do not contend one with another. Do not commit whoredoms, 7th of the 10 commandments, D&C 59:6. Black and white are equal (no racism). Bond and free are equal (no elitism). Male and female are equal (no sexism). Heathen, Jew, and Gentile are equal (no religious discrimination). Racism is a cultural artifact that thankfully is going away in contemporary society. In my youth, people talked about miscegenation in negative terms. You hardly hear that word anymore. In the course of my service in the Church, I have referred dozens of people to Edward Kimball's tremendous article about his father's revelation on priesthood. Elitism is a cultural artifact whose influence is being mitigated by the Internet. BYU Pathway Worldwide, for instance, makes world-class education accessible to most humans on the planet. Sexism is a diminishing cultural artifact. The first time I flew with a female co-pilot in the cockpit, Delta Airlines announced this paradigm-shifting advance over the intercom and we passengers erupted in the seat-belts-fastened equivalent of a standing ovation. This does not mean we should expect female Apostles. The Savior's precedent in the New Testament, 3 Nephi, and the Restoration has males holding priesthood keys. Religious monopoly is a cultural artifact. Each March, the largest celebration of the Holi Festival in the Western Hemisphere is at the Sri Sri Radha Krishna Temple in Spanish Fork, Utah where thousands of BYU and UVU students gather to throw colored powder at each other and eat Indian food. Most of these young people will be in Sacrament Meeting the following Sabbath. So far, so good. The BYU students on the lawn between the Wilkinson Center and the Law School are pretty much in sync with the Book of Mormon on racism, elitism, sexism, and religious exclusivity. The modern cultural rejection of the law of chastity, though, is plainly contrary to eternal truth revealed in the Book of Mormon. John W. (Jack) Welch is my primary source for the idea that the Book of Mormon is our handbook of instructions for living in the 21st Century. Kirk Magleby volunteers as Book of Mormon Central's Executive Director. Book of Mormon Central builds enduring faith in Jesus Christ by making the Book of Mormon accessible, comprehensible, and defensible to the entire world. We currently publish in English and Spanish. As part of the 189th Annual General Conference today, the Church released its statistical report for December 31, 2018. As of year end, total Church membership stood at 16,313,735 which is an increase of 195,566 over 2017 when membership was 16,118,169. This is a growth rate of 1.21%, the lowest since 1937 when the great depression was ravaging the global economy. Here is a chart showing Church growth since 1975 with significant developments in certain years noted and the fastest growing years highlighted in yellow. 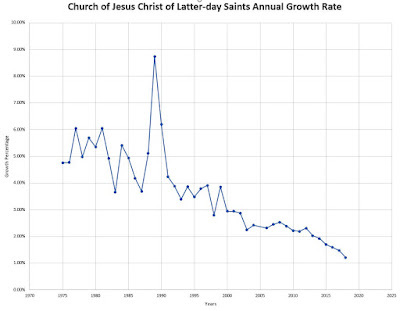 This is what the Church growth rate looks like as a graph. As with all images on this blog, click to enlarge. Something important happened in 1989 when the Church grew by 8.74%. The long-term trend is unsettling. All is not well in Zion. Growth has steadily slowed since 2000. What happened in 1989? In October, 1988 General Conference, Pres. Ezra Taft Benson gave his memorable talk about flooding the earth with the Book of Mormon. The Saints responded. Missionaries had boxes of books to give investigators with our photographs and testimonies pasted inside the front cover. The Book of Mormon is what happened in 1989. It is the divine tool uniquely designed by God to gather Israel in the last days. In 1989, we as a Church helped the Book of Mormon accomplish its intended purpose. The Internet is a network that empowers individuals and diminishes the influence of hierarchies. 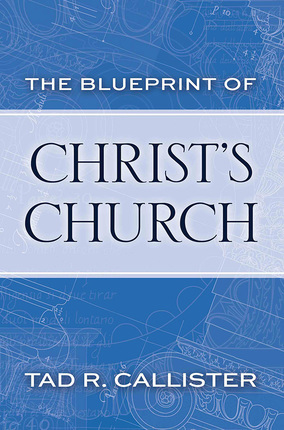 The Church, the Kingdom of God on earth, is the ultimate hierarchy. Our prophet, Pres. Russell Marion Nelson Sr., receives revelation directly from God. It doesn't get any more hierarchical than that. Transparency is the coin of the realm in the Internet age. The Church, a Kingdom that is partly divine and partly human, struggles with transparency as indeed it must. Some things are sacred and pearls should not be cast before swine. Trust in institutions is diminishing. How do people make buying decisions today? They look for five stars from a neighbor on Amazon rather than reading the manufacturer's slick and glossy brochure. You don't sell much stuff knocking on doors anymore. We need innovative new systems to keep our missionaries productive. Social media is hard to manage. In the old days, the Church could air Home Front spots on prime time TV or take out an ad in Reader's Digest and get our message out. Nowadays, each of the myriad content distribution channels has different protocols and audience expectations. Search engines only identify "relevance," not truth. Search results on many subjects are more likely to be faith-destroying than faith-affirming. Anti-Mormons troll Church content online. The Church can post a terrific video on YouTube and haters within hours will post multiple low-budget videos contradicting the Church's position. After a member or investigator finishes watching the Church's polished production, YouTube's algorithm will suggest the attack videos. Authenticity can outperform professionalism. The Church generally projects a clean-cut, classy image. Crude, unkempt reality content often gets more views, likes, and shares. Humor rules. Most Church content is not very entertaining. Diversity and tolerance are considered ultimate virtues. Obedience to eternal truth is often spun as old-fashioned if not discriminatory. Twenty years ago, people required an average of 9 interactions with a product before they made a purchase decision. Today, 24 touch points are required on average before a prospect becomes a customer or an investigator a member, and that number is steadily rising. Is the Church true? Yes. Is the Book of Mormon the most divine object most of us will ever hold in our mortal hands? Yes. Will the Savior return in glory and clean up this mess? Yes. Are we gathering Israel on both sides of the veil and preparing the world for the Second Coming? Yes. Will the Church figure out this online technology thing? Yes. "The mills of the gods grind slowly, but they grind exceedingly fine." I took several members of the Book of Mormon Central staff to Google Headquarters in March, 2018. Visiting with a number of Latter-day Saint Googlers, we learned that two of the Apostles had been in Mountain View a few months before us. After learning that Google has eight products used by more than a billion customers (Search, Gmail, YouTube, Maps, Android, Chrome, Play Store, Drive) Elder Bednar reportedly said that we in the Church need to raise our sights and increase our expectations. Of the 16,313,735 baptized members of record on December 31, 2018, how many attend Church on a given Sunday? 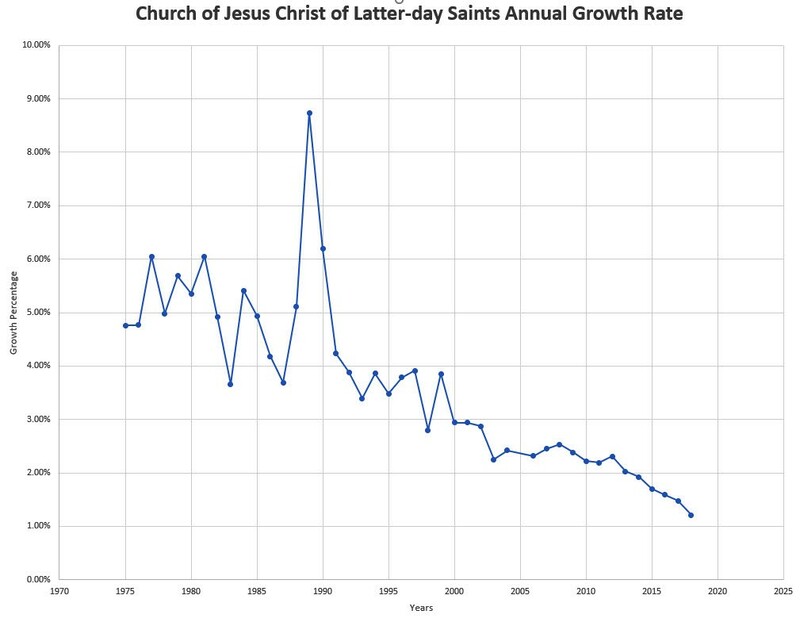 About 30% according to Matt Martinich who publishes the LDS Church Growth blog. That would be about 4.9 million people in the pews which is likely a reasonable proxy for the number who make the Book of Mormon an important part of their daily life. 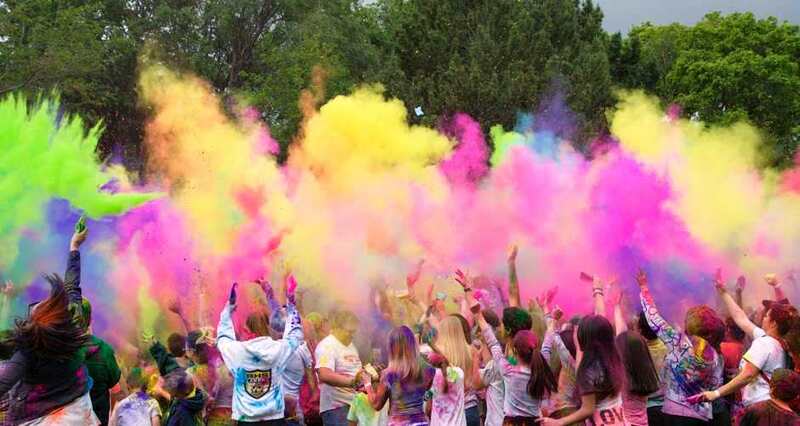 The United Nations estimates there are 7.7 billion humans on the planet in April, 2019. The Book of Mormon went on sale to the public on March 26, 1830 in Palmyra, NY. After 189 years, the Book of Mormon has achieved a market penetration rate of .000636, less than 1/15 of 1%, or about 6 people out of every 10,000. FARMS was doing pretty much everything on the prophet's list in the 1988 - 1989 time frame. And, Book of Mormon Central is doing pretty much everything on the list today, albeit at a modest scale. In order to learn how highly effective organizations scale in 2019, I took Zander Sturgill and Daniel Smith from Book of Mormon Central with me to Traffic & Conversion Summit 2019 in San Diego in February. The good news is some of the most talented digital marketers on earth are faithful Latter-day Saints who in their heart of hearts want to use their skills someday to help build the Kingdom. The additional good news is religious content has many characteristics compatible with modern distribution technologies. The ideal mix for the Church in 2019 is to produce 50% of its own online content, with 30% coming from members (user-generated content) and the other 20% from trusted independent voices such as Book of Mormon Central (affiliates). The actual numbers right now are closer to 90% coming from the official Church, 8% from members, and 2% from trusted independent organizations. The ideal is achievable with increased donor support which will drive member awareness. The Church, its members, and those of us in supporting organizations are getting more adept at the modern media landscape every day. With Pres. Nelson's extraordinary leadership, can Church membership growth numbers come roaring back to the levels they achieved during Pres. Benson's era? Yes, if we help the Book of Mormon accomplish its intended purpose. 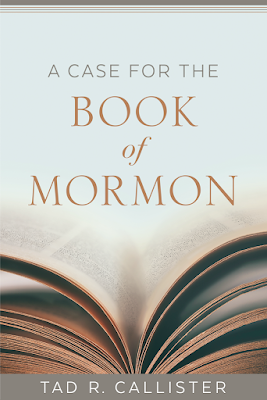 As Elder Christofferson said in his April 7, 2019 General Conference address, publication of the Book of Mormon was the signal the gathering of Israel in the last days has begun, and the Book of Mormon is the instrument of that gathering and conversion. Pres. Nelson has repeatedly emphasized the gathering of Israel is the most important thing taking place on earth today. Nothing else compares in magnitude. Nothing else compares in majesty. Kirk Magleby volunteers as Executive Director of Book of Mormon Central which makes the Book of Mormon accessible, comprehensible, and defensible to the entire world in English and Spanish. In Mosiah 12:2 Abinadi recounts his divine mandate to prophesy against King Noah and his wicked priests. What was the first thing the Lord instructed Abinadi to do? Open his mouth? Speak certain words? Cry with a loud voice? No. The first thing Abinadi was told to do was stretch forth his hand. Alma 10:25 tells us what Amulek did when things began to get heated as he preached in Ammonihah. Amulek stretched forth his hand and then cried the mightier to his angry audience. Alma did the same thing. He stretched forth his hand toward the people of Ammonihah just before he energetically called them to repentance Alma 13:21. About eight years later Alma was preaching to the Zoramites on hill Onidah in Antionum. A spokesman for the lower class arose and recounted the persecutions he and his friends had suffered. Alma turned toward these humble people, but before he said anything to them, he stretched forth his hand Alma 32:7. Samuel the Lamanite prophesied to the Nephites atop a wall surrounding the city of Zarahemla. But what did he do before speaking to the hostile crowd? He stretched forth his hand Helaman 13:4. In the most dramatic moment in the text, the risen Lord descended from heaven and appeared to the Nephites assembled at the temple in land Bountiful. 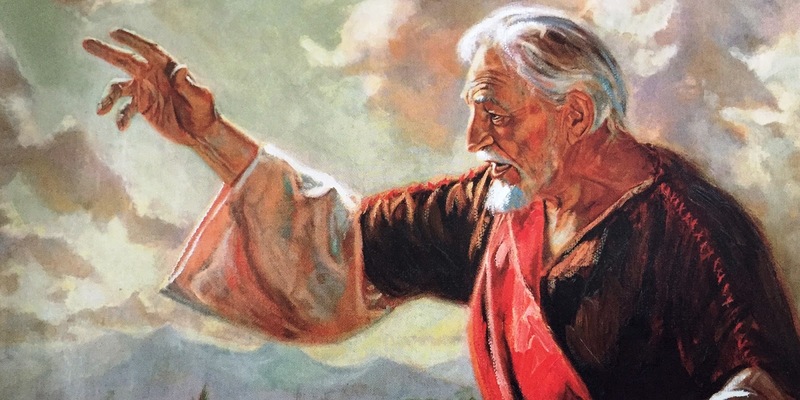 Before speaking, he stretched forth his hand 3 Nephi 11:9. After instructing his twelve disciples, the Savior again addressed the multitude, but before speaking he stretched forth his hand 3 Nephi 12:1. Seven of the most iconic discourses in the text were preceded by a hand gesture. What is going on? Abinadi, Amulek, Alma, Samuel the Lamanite, and the resurrected Savior were all speaking in Mesoamerica where important people and deities stretched forth their hand to give a major speech. The Book of Mormon authors faithfully recorded an ancient Mesoamerican cultural practice that anthropologists have only recently recognized. These examples are in approximate chronological order. This Olmec image is dated ca. 1,000 BC. "That the Maya and other Mesoamerican peoples highlighted some kinds of speech as more important, more authoritative, than others is made evident by a convention in which an extended index finger secured emphasis." Stephen Houston, David Stuart, and Karl Taube, The Memory of Bones: Body, Being, and Experience among the Classic Maya (Austin: University of Texas Press, 2006) p. 250, fig 7.29.a. La Venta monuments date ca. 600 BC. La Venta may be where the Mulekites landed. Note the heavily bearded figure on the right. Both individuals have hands stretched forth in a speech gesture. 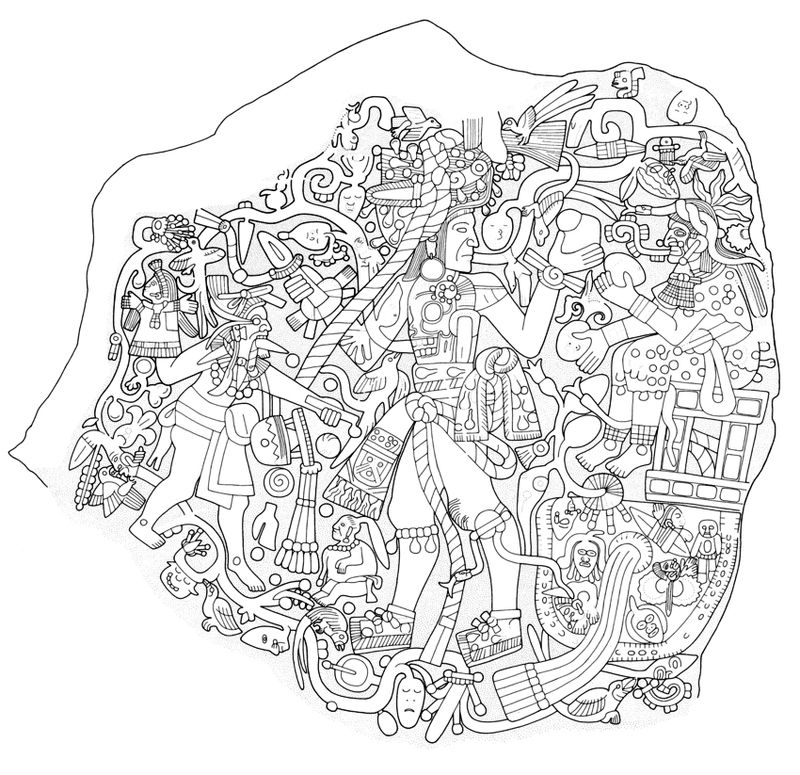 Similar depictions are on Tres Zapotes Stela D and La Venta Altars 4 and 7. This scene depicts a bearded old man wearing a conical hat tending a flaming incense burner. His left hand is stretched out in a speech gesture. Izapa Stela 5 is generally dated ca. 300 BC. Izapa may be the land of the Lehite's first inheritance on the west coast of the greater land of Nephi. This scene depicts a younger man with an elaborate headdress holding a stylus or perforator in his left hand. A speech scroll comes out of his mouth and his right hand is extended in a speech gesture. This image of KJ Monument 65 was produced by a high definition 3D laser scan reported in Travis F. Doering and Lori D. Collins, "Revisiting Kaminaljuyu Monument 65 in Three-Dimensional High Definition" in Julia Guernsey, John E. Clark, and Barbara Arroyo, editors, The Place of Stone Monuments: Context, Use, and Meaning in Mesoamerica's Preclassic Transition (Washington, DC: Dumbarton Oaks, 2010). All three enthroned rulers have stretched out their hands in a speech gesture. 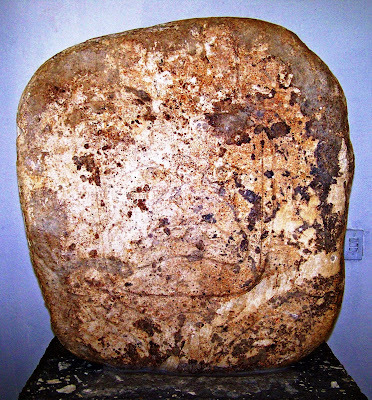 The back side of the stone has another example of an elite personage with hand outstretched in a speech gesture. Kaminaljuyu underlies the northwest part of modern Guatemala City. It may be the city of Nephi. See the blog article "Kaminaljuyu." Monument 65, discovered in 1983, dates to ca. 150 BC, very close to the time Abinadi was in King Noah's court. For insight into the meaning of the objects displayed between these KJ figure's noses and lips, see the blog article "Partake of the Fruit." San Bartolo is a Guatemalan site with spectacular murals that date ca. 100 BC. This scene depicts two enthroned gods flanking a dancer. Both gods have stretched forth their hands in a speech gesture. 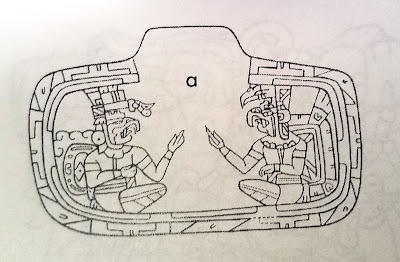 "As in the case of the San Bartolo gods, they both site cross-legged and point with their extended index fingers, a convention for discourse that is present from Olmec times to the sixteenth century." 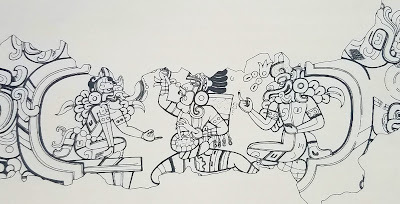 Karl A. Taube, William A. Saturno, David Stuart, and Heather Hurst, The Murals of San Bartolo, El Petén, Guatemala, Part 2: The West Wall (Bernardsville, NC: Boundary End Archaeology Research Center, 2010) p. 75. This image dates ca. AD 250. "Two of the figures appear to be presenting decorated cloth, and another emits a large speech scroll while gesturing with his extended index finger. 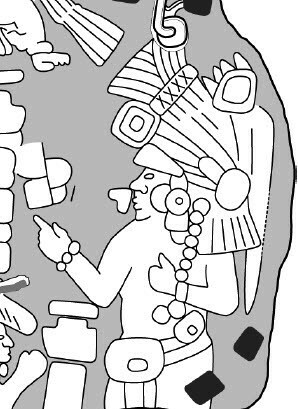 From the late Preclassic to late Postclassic periods, this hand gesture denotes speech in Maya art." Karl A. Taube, "Tetitla and the Maya Presence at Teotihuacan" in Geoffrey E. Braswell, editor, The Maya and Teotihuacan: Reinterpreting Early Classic Interaction (Austin: University of Texas Press, 2003) p. 283. The Dresden Codex was painted ca. AD 1,300. It is believed to be a copy of an earlier manuscript. 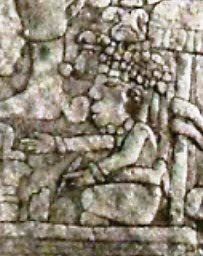 Itzamna, the right-hand figure, is shown talking to the maize god. Several other figures in the Dresden Codex are also depicted with hands extended in a speech gesture. A speech gesture is attested in the New Testament with Paul before Agrippa Acts 26:1. Moses performed miracles by stretching forth his hand Exodus 9:22, 10:12, 14:21. David Michael Calabro, formerly with the Maxwell Institute, wrote his dissertation at the University of Chicago on various ritual hand gestures in the ancient near east. Human hands are ubiquitous. But, the consistent correlation of authoritative speech with a hand gesture in both the Book of Mormon and Mesoamerican iconography supports the idea of a cultural connection. Steel is carburized or quenched and tempered iron. Iron was known anciently from meteoric sources. King Tut's famous steel dagger on display in the Cairo Museum was pounded from meteoric iron. Meteoric iron is rare on the surface of the earth. High grade iron ores such as hematite and magnetite are much more abundant and are mined commercially today. We have known about polished Olmec hematite mirrors for decades. This is a similar example. 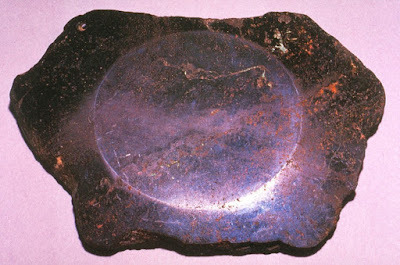 Both mirrors are dated prior to 400 BC, the traditional date associated with the Olmec collapse. We also know that another form of iron ore, ilmenite (a principal modern source of titanium), was worked at industrial scale at the first Olmec capital, San Lorenzo. Ann Cyphers Guillén found 8 tons of it at a workshop in the SE sector of the San Lorenzo plateau. This photo is in Ann Cyphers Guillén, "San Lorenzo Tenochtitlán," in Los Olmecas en Mesoamérica, edited by John E. Clark, (Mexico City: Citibank/Mexico, 1994). The ilmenite was imported from Chiapas and Oaxaca. Similar concentrations of worked ilmenite pieces were found in Plumajillo and Amatal, Chiapas. The perforations were made with a drill, likely using fine sand as an abrasive. The San Lorenzo workshop dates from ca. 1,100 BC. Several of the San Lorenzo artifacts were analyzed by BYU geologists. 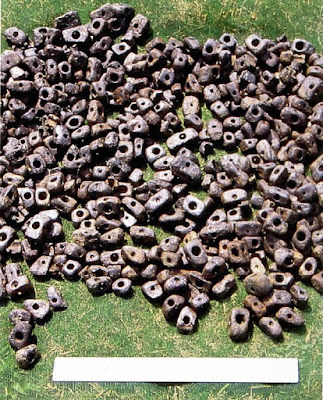 The report is Steven E. Jones, Samuel T. Jones, and David E. Jones, "Archaeometry Applied to Olmec Iron-Ore Beads," BYU Studies 37:4 (1997-98). 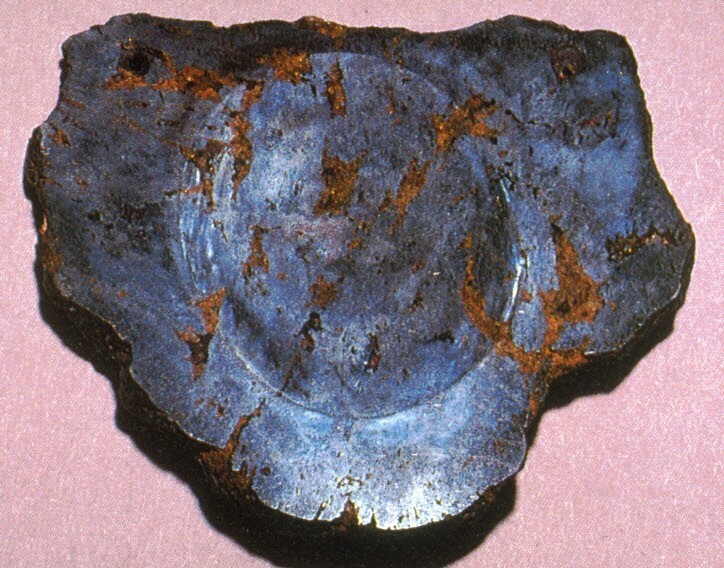 The iron artifacts could have been used as jewelry, chain mail armor, or miniature tools (a typical bead is 3 centimeters long) if fitted with a small wooden haft. Matt Roper sent me this little gem. This is a polished hematite sculpture from the middle pre-classic (ca. 800 BC) in the Wadsworth Atheneum Museum of Art in Hartford, CT.
An image of the piece was first published in 1943. 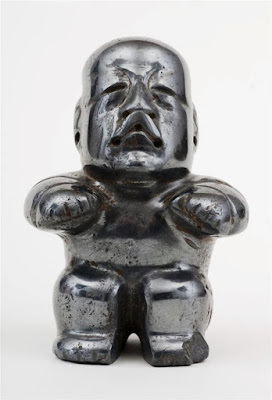 It is the only known Olmec sculpture fashioned from iron. 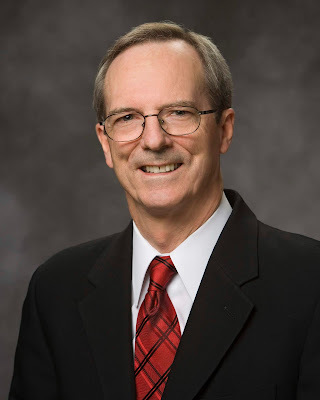 General Sunday School President Elder Tad R. Callister of the Seventy is well-known among Latter-day Saints as an author and engaging speaker. have been well received. Now, Elder Callister has turned his talented pen (or more likely, keyboard) toward the Book of Mormon. 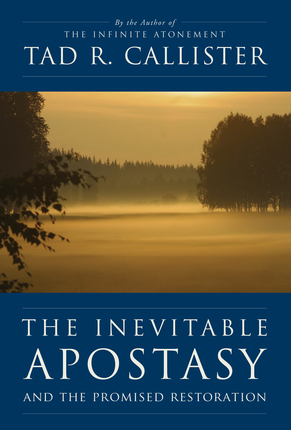 His latest book is entitled A Case for the Book of Mormon. It is published by Deseret Book and appeared on store shelves March 4, 2019. This handsome 262 page book should become a classic in Latter-day Saint letters. 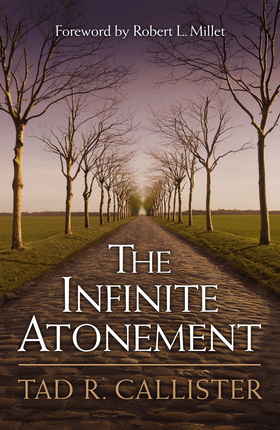 It strikes a wonderful balance between certitude and polemic, spiritual and intellectual, doctrinal and narrative. Elder Callister had a 34 year career as a tax attorney and logical precision is evident on every page. Some of my favorite parts were his personal stories from the mission field and from his many years in Church service. And, of course, since I volunteer as Executive Director of Book of Mormon Central, I was thrilled to see Book of Mormon Central and members of our staff (Jack Welch, Matt Roper, Neal Rappleye) mentioned or referenced over 40 times. Congratulations to Elder Callister for a significant new contribution to Book of Mormon studies. I didn't just read this book. I devoured it in about six hours and highly recommend it. 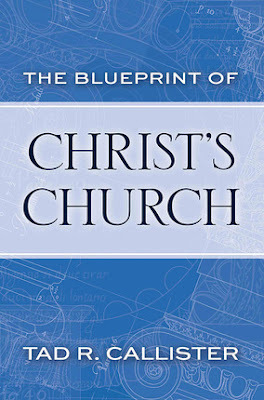 After finishing the read, I promptly authored positive reviews on Deseret Book and Amazon. 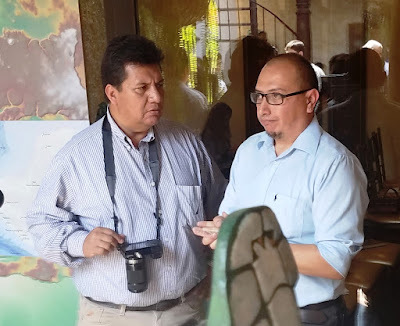 Javier Tovar and I spent February 14th and 15th, 2019, in Guatemala City and Antigua. We visited Elder Clate and Sister Carol Mask who are currently serving an oral history mission. We visited with Rolando Amado, a retired agronomist soon to earn a degree in anthropology. Both Elder Mask and Brother Amado are serious life-long students of the Book of Mormon. We got to spend time with Richard Hansen, director of the massive Mirador Basin project and one of the most renowned archaeologists alive today. We visited the Museo Nacional de Arqueología y Etnología and the Minerva Park relief map, both in Guatemala City. We were hoping to get to the Museo Popol Vuh but didn't make it. We did get to the former Museo Miraflores only to find it closed for massive remodeling. That museum was quite new and very impressive when I visited at the end of 2015. Someone is spending serious money to do an extensive makeover just a few years after the original opening. Museo Miraflores is dedicated to the important early highland Maya site Kaminaljuyu (see the blog article "Kaminaljuyu"). The enlarged space will showcase recent finds at Kaminaljuyu where the ancient city underlies much of modern sprawling Guatemala City. Museo Miraflores is scheduled to re-open in 2020. 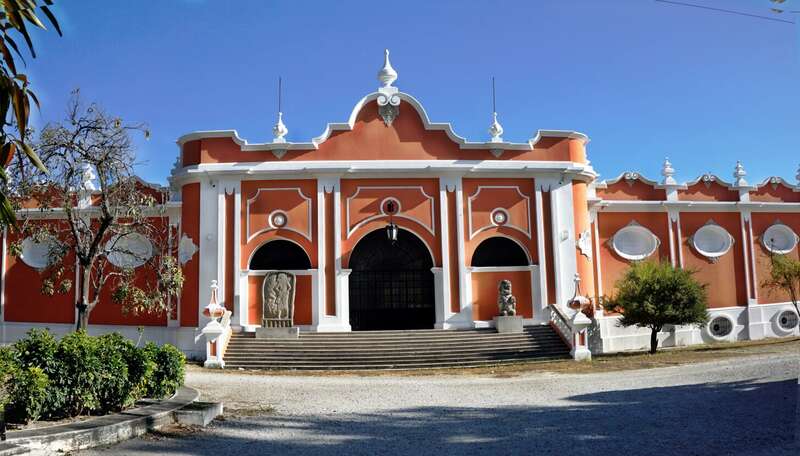 Another important museum dedicated to the Mirador Basin will open in Antigua in 2020. BYU's Ray Matheny began excavating at El Mirador in 1978. 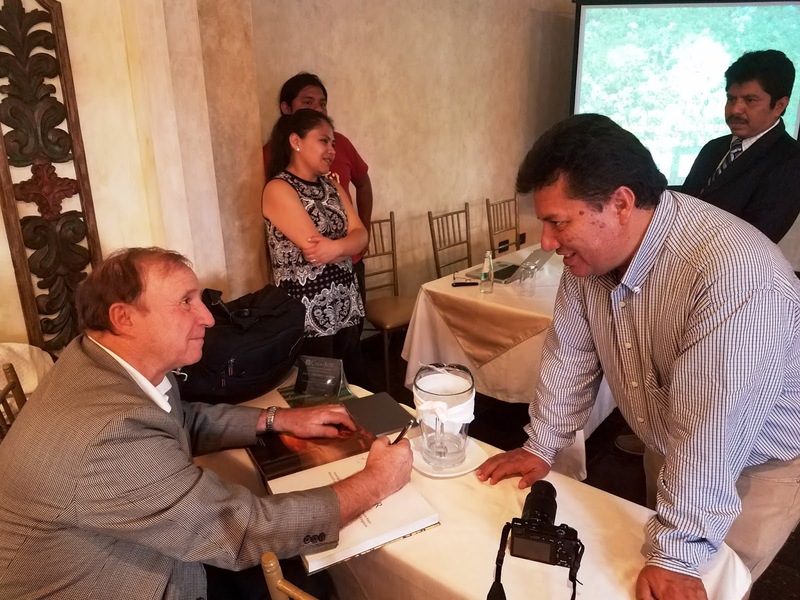 What Richard Hansen and others have discovered at El Mirador, Nakbe, Tintal, and other massive sites in the basin has re-written early Maya history with potentially profound implications for the Book of Mormon. The venerable Museo Nacional opened in 1930. Striking depictions of beards are included in the Museo Nacional collection. DNA is a top Book of Mormon question around the world right now. Antis slam the Nephite text claiming Lehi's DNA has not been found. Naive Latter-day Saints misinterpret population genetics data in a misguided attempt to link Algonquins with Israelites. The Church's Gospel Topics Essay sheds light on a complex biological subject but doesn't definitively settle anything. People tend to be less than satisfied with the answer "We just don't know." Beards are a strong response to the DNA question. 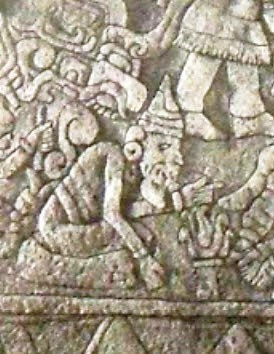 A heavily-bearded population once lived in Mesoamerica as attested by the thousands of beard depictions we see in ancient art and iconography. That population passed through one or more genetic bottleneck events like the mass die-offs at hill Ramah/Cumorah. By European contact in AD 1492, almost all surviving native Americans were beardless or capable of growing only scant facial hair. Bilbao is an important archaeological site on the Pacific slope of Guatemala near Santa Lucia Cotzumalguapa, 60 air kilometers from Kaminaljuyu. It was occupied in pre-classic (Book of Mormon) times. Note that three of the five decapitated heads depicted on the monument above are bearded. Physiological characteristics often facilitate ethnic cleansing. The crude figurine above is in the Ethnologisches Museum, Berlin. Kaminaljuyu Stela 10 in the Museo Nacional dates to ca. 200 BC. Note the florid beard. 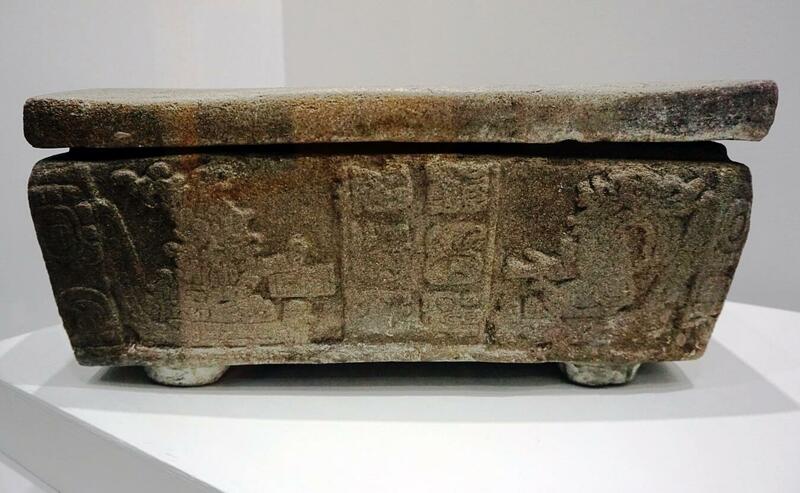 A few years ago we were excited to receive reports of a stone box found in Hun Nal Ye Cave in Alta Verapaz. The box depicts scribes writing on codices and the container was fashioned to hold codices. The original is now on display in the Museo Nacional. Thrones are mentioned several times in the Book of Mormon (Alma 60:7,11). A good example from Piedras Negras is on display in the Museo Nacional. Guatemala has some of the most variegated topography on earth. Its highest point, Tajumulco Volcano, rises 4,220 meters (13,845 feet) and winter snow accumulates in the higher elevations. The famous concrete relief map in Minerva Park, completed in 1905, gives tourists an idea of this monumental landscape. As with all images on this blog, click to enlarge. Our narrow strip of wilderness runs in nearly a straight line from the East Sea (Caribbean) to the West Sea (Pacific) as described in Alma 22:27. Today we call this line of cliffs with east west rivers flowing at their base the Polochic Fault which is the tectonic boundary between the North American plate on the north and the Caribbean plate on the south. See the blog articles "The Narrow Strip of Wilderness" and "Ubiquitous Narrow Strip." Visiting with some of the Saints in Guatemala about the Book of Mormon, some interesting new insights emerged. 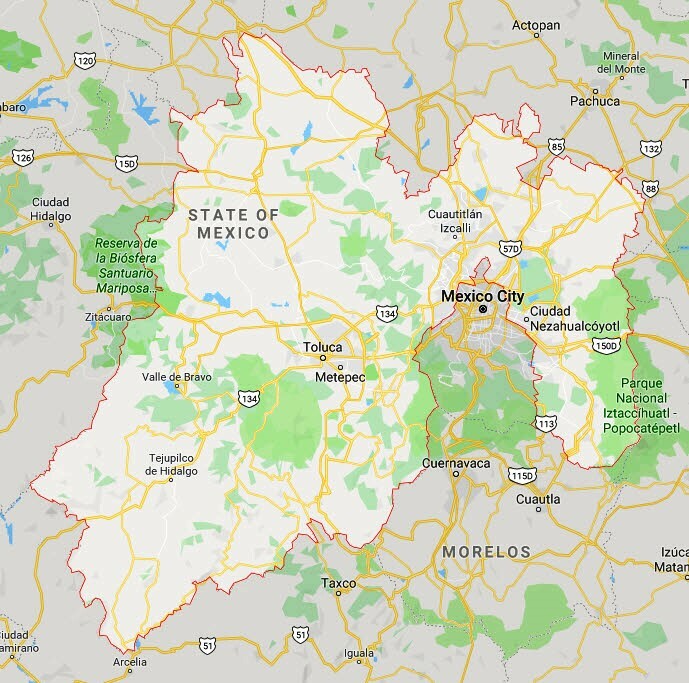 A. Mexico is a city, a state, and a country. 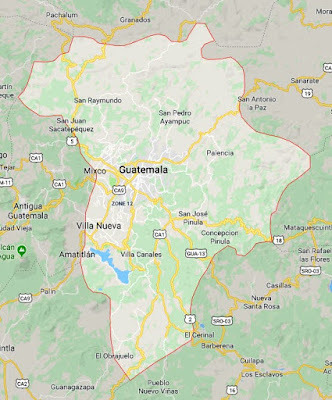 Guatemala is a city, a department, and a country. In the Book of Mormon, Nephi is a city Alma 47:31, a lesser land Alma 47:20, and a continental-scale greater land Alma 50:8,11. Zarahemla is also a city 3 Nephi 9:3, a lesser land Alma 62:6, and a continental-scale greater land Alma 50:7, 11. This pattern is not common. You don't find the city of France in the Department of France in the nation of France. Ditto India, India, India or almost any other nation you can think of. B. Some have proposed the site of Mixco Viejo, 30 kilometers NW of Kaminaljuyu, for the city of Nephi. The reconstructed site tourists visit today is post-classic, well after Book of Mormon times. Some archaeologists, though, have found a pre-classic (Book of Mormon time period) occupation layer. Terrain makes Mixco Viejo eminently defensible. Additional excavation in the future is unlikely because Instituto de Antropología e Historia (IDAEH) considers the site developed. 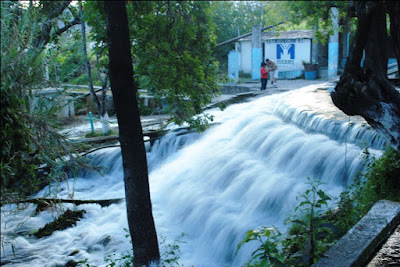 C. An interesting candidate for head of Sidon Alma 22:27, 29 is Nacimiento del Rio San Juan on the outskirts of Aguacatán, Huehuetenango where the San Juan River literally bursts out of the side of a mountain. The volume of water flowing from this fountainhead is unmatched by any other spring in Guatemala. D. Alma 21:18 can be interpreted to mean the land of Ishmael was the land of both Lamoni's and Ammon's inheritance. Lamoni's relationship to the land of Ishmael is clear. He was king over the land of Ishmael Alma 17:21. If Ammon also had a relationship to the land of Ishmael, it could imply the Lehi-Nephi of Zeniff, Noah, and Limhi was later renamed Ishmael. I find this chain of events possible but doubtful based on the similar word pattern in Alma 21:17 where "their sins" and "their fathers" refers to Lamanites in general. E. Alma 51:20 says the king-men had multiple towers in multiple cities. Guatemalans envision a scene like this from iconic Tikal when reading this passage. F. Latter-day Saint scholars through the years have commented on the seven ancestral caves/boats/tribes tradition prevalent in many parts of Mesoamerica. 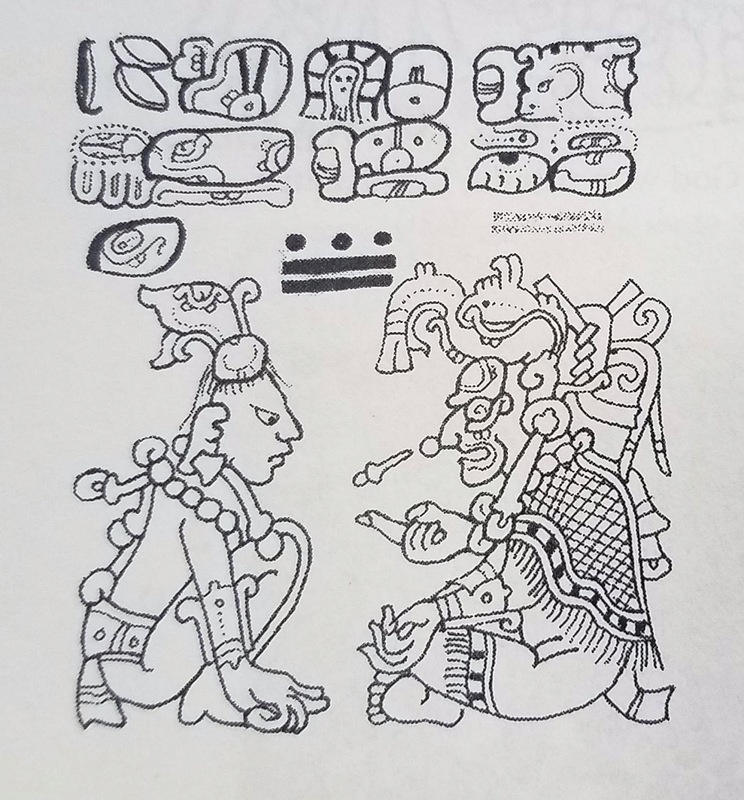 One example is Diane Wirth's "Revisiting the Seven Lineages of the Book of Mormon and the Seven Tribes of Mesoamerica" in BYU Studies Quarterly 52:4 (2013). Seven founding lineages are mentioned in Jacob 1:13, 4 Nephi 1:37-38, Mormon 1:8, and D&C 3:17-18. Seven founding lineages are part of the highland Maya tradition recounted in Quichean literature such as Popol Vuh and Annals of the Cakchiquels. Guatemalans also point to Bilbao Monument 21 as a possible iconographic representation of the seven founding lineages coming to the Pacific coast of Guatemala in a boat with three faces shown left of the tassel in the lower right-hand corner of the carving and four faces shown on the right. The two most powerful Quichean groups in highland Guatemala today are the K'iche' and the Kaqchikel. Both believe their forefathers came to Guatemala in ocean-going vessels and both talk of seven founding lineages divided into progenitor groups of four and three. The Kaqchikel believe they descend from the four and the K'iche' from the three. Other possible correlations between Kaqchikel ethnohistory and the Book of Mormon are in the blog article "Kaqchikel Chronicles." Other possible correlations between K'iche' ethnohistory and the Book of Mormon are in the blog article "Titulo de Totonicapan." 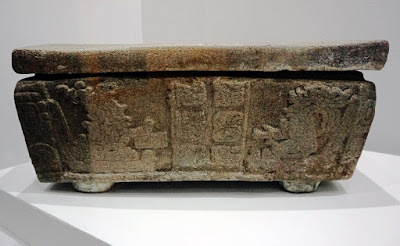 In addition to its possible depiction of the pan-Mesoamerican tradition of seven ancestral lineages, Bilbao Monument 21 shows several faces attached like fruit to a vine. This is another example of the fascinating theme we explored in the article "Anthropomorphic Trees." Some Latter-day Saint Mesoamericanists (such as John E. Clark) consider images of humans growing/flowering like trees powerful evidence in favor of the Book of Mormon Alma 32:28-41, 33:1. G. Rolando Amado showed us an Egyptian-style figurine head he found in a farmer's field near the port city of Ocos. His children and grand-children played with it over the years and the pharaonic beard broke off. We did not get a photo. 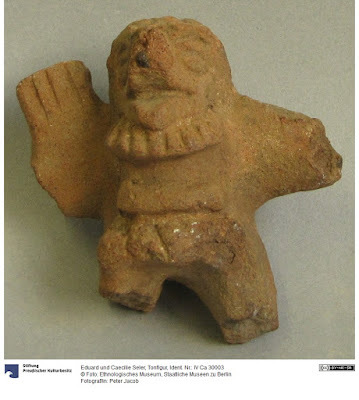 This artifact should be date-tested like the Roman figurine head described in the article "Roman Figurine Head in Ancient Mexico." The main reason we went to Guatemala was to attend a conference in Antigua entitled "3,000 Years of Maya Knowledge" keynoted by Richard Hansen. These are my notes from the conference with editorial markers numbered 1 to 41 where data may have Book of Mormon relevance. Edwin Roman is a native Guatemalan with a PhD from UT Austin. His dissertation was on Teotihuacan influence in the Peten. He has worked at many Guatemalan sites, particularly El Zotz with Stephen Houston. Roman: In the lowlands, water is scarce and ancient public works for water management are extensive. Ca. 5,000 BC maize agriculture came into Guatemala from Mexico. El Zotz in the Buenavista Valley was on the route from Tikal to the San Pedro River. The Laguna El Palmar was an ancient lake in the area. Sites were built around the lake shore. The PACUNAM LiDAR Initiative (PLI) revolutionized our understanding of this area. See the articles "LiDAR" and "Ground-Truthed LiDAR." LiDAR identifies structures. 1 Pre-classic structures have conical rooflines while classic buildings have flatter roofs. Most classic structures are built atop pre-classic precursors on the interior of the pyramid. 2 El Palmar dates to 800 BC. Gran Cival dates to 1,100 BC and features an E Group (structures oriented astronomically eastward to the rising sun). 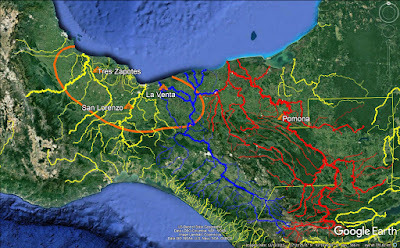 3 Seven sites in the pre-classic Buenavista Valley including El Zotz and Naranjo had E Groups. There is so much order evident in the architecture that the ancient Maya must have had standard units of measurement 4. Consensus has not yet emerged on the absolute value of any standard units. Triadic groups appear in the late pre-classic following the pattern we see at Holmul, Uaxactun, and Tikal. 5 Roads appear in the late pre-classic, as well as extensive residential areas. Then about 6 AD 200 many sites declined in an event known as the pre-classic collapse. Populations fell, emigrants left the area, there were droughts, and territorial conflicts began to disturb this formerly tranquil region. 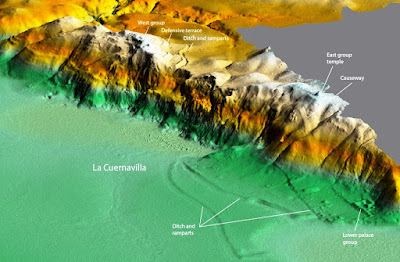 This time of instability followed the AD 150 collapse of gigantic El Mirador about 60 air kilometers to the north. 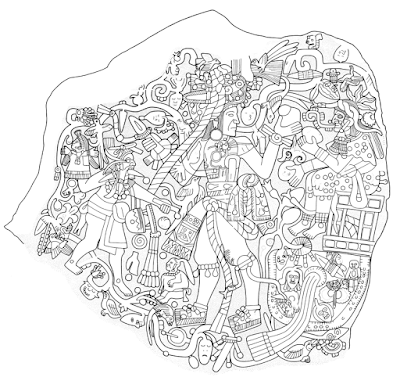 Tikal and Yaxha apparently did not suffer a pre-classic collapse. Water management features called "aguadas" appear in the early classic. El Zotz at apogee probably had 5,000 permanent residents. In the early classic we see 7 defensive walls and terraces and the cult of 8 divine kingship. Then on 9 January 16, AD 378 Sihyaj K'ahk' came on the scene from Teotihuacan and nothing was ever the same again. Eight sites including Bejucal, El Zotz, and Tikal have inscriptions mentioning Sihyaj K'ahk' (born of fire) by name. In the early classic, following the Teotihuacan "entrada," we see a kind of Pax Tikalense reminiscent of the period prior to the collapse of El Mirador. Ux Yop Huun was an important god in this period. Masks appear on buildings. Canals are built. Cave communities appear. Cacao cultivation is important. Large-scale defensive structures are erected. 10 One defensive wall was 6 meters (19 feet) high. The tallest defensive wall found to date was 7.6 meters (25 feet) high. Near El Zotz, LiDAR has identified a veritable 11 fortress, the largest defensive structure known in the Peten. Thomas G. Garrison named it "La Cuernavilla." National Geographic published an article about La Cuernavilla on March 1, 2019. The article quotes Stephen Houston saying the heavily fortified site had 20 foot high walls, moats, watchtowers, and supplies of round stones that probably served as ammunition for warrior's slings. The article says the Maya fought bitter wars that ended in bloody sacrifices. Houston describes "an almost palpable sense of fear in this landscape." Tikal had a massive ditch and rampart stretching for miles. A causeway led from La Corona northeasterly toward Calakmul. By 12 AD 500 there are wars and shifting alliances. Shark teeth appear in El Zotz, obviously traded into the area from distant shores. By AD 600 tombs are built with murals adorning the walls. 13 Commerce is more limited than it was before. Teotihuacan in Central Mexico has collapsed. By now, El Zotz has an emblem glyph and the red polychrome pottery diagnostic of the site is abundant. Ca. 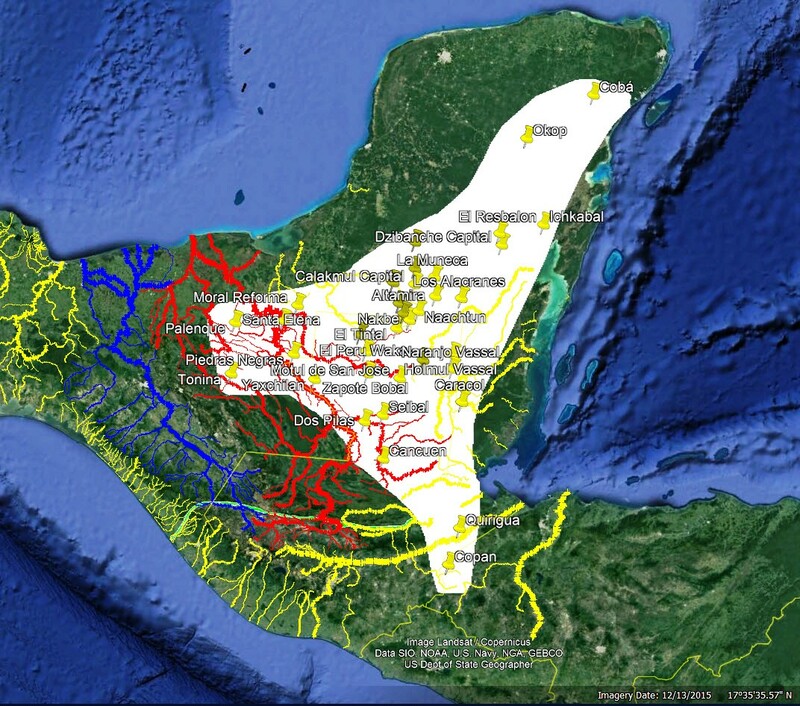 AD 800 is the classic Maya collapse, a period of drought and warfare. Cesar Castañeda was supposed to present, but he was unable to attend, so Edwin Roman gave another presentation about Teotihuacan influence in the Peten, the subject of his doctoral dissertation. 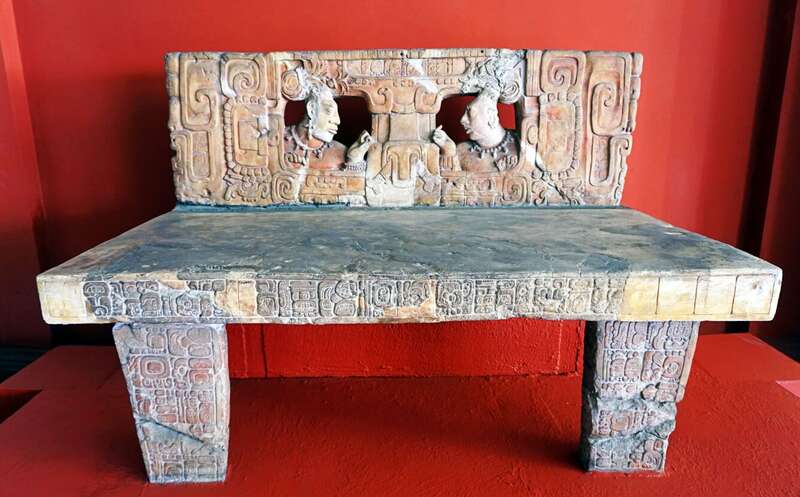 Ancient Teotihuacan influence was discovered at Kaminaljuyu and along the Pacific coast of Guatemala (Balberta, Montana) in 1950. David Stuart made epigraphic advances reading Mayan and now we know that the "entrada" of Teotihuacan is part of the 14 historical record. In AD 378 Teotihuacan conquered the Maya in the Peten. We see tripod vases, stucco decor on vases, and the Maya name Sihyaj K'ahk'. He was never a king of a single city state, but he was a military conqueror and the first person we know of given the title kaloomte' (emperor). Naysayers said this conquest was 15 logistically impossible because Teotihuacan is 1,000 air kilometers distant from Tikal. They said there was 16 little material evidence of a Teotihuacan presence. And they said Sihyaj K'ahk' must have been 17 merely a diplomatic envoy. We now know all these attempts at minimization were wrong. We find green obsidian from Pachuca (Pachuqia) at Altun Ha. Caracol has cremated burials and green obsidian by AD 330. Teotihuacan itself rose to prominence between 18 100 BC and the time of Christ. Many of the early settlers of Teotihuacan came from the 19 south. At AD 300 the great Pyramid of the Sun was built without any prior structure underneath and the Avenue of the Dead was constructed. Teotihuacan was a cosmopolitan society with people from Oaxaca, Puebla, Veracruz, and the Maya world. The Tetitla murals are in a Maya-like style. And, just three years ago, the murals at the Plaza de las Columnas were discovered. 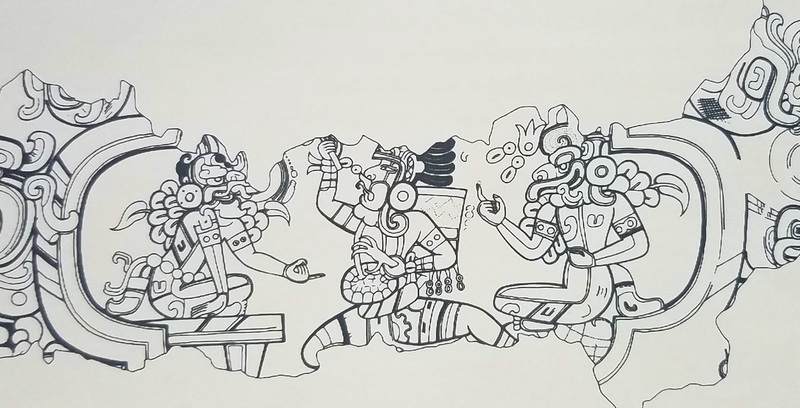 These murals, which date to AD 300 - 330, have clearly Maya iconography and symbolism. In the Ciudadela we find jade, feathers, and conch shells which are all important Maya symbols. Ca. AD 300 Teotihuacan underwent a 20 revolution. The Pyramid of the Feathered Serpent was burned. The Teotihuacan empire was all about 21 trade and control of resources rather than political subjugation. 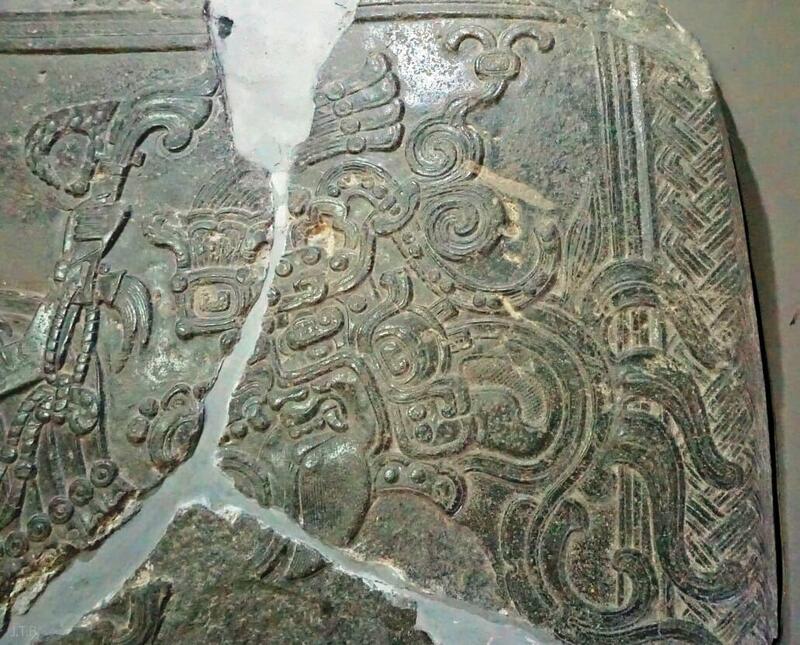 In the Pyramid of the Moon, Maya-style burials were found with jade ornaments. Tikal had a vase in Teotihuacan style made with clay from Central Mexico. The Aztecs reached the Soconusco, 800 - 900 air kilometers distant from Tenochtitlan. Among military scientists, it is conventional wisdom that a soldier carrying a 50 pound pack can march 22 30 kilometers (20 miles) in one day. That limits things such as the area around its capital a city state could reasonably defend. Teotihuacan controlled 2 sites in the 23 Tuxtlas: Matacapan and Tres Zapotes. 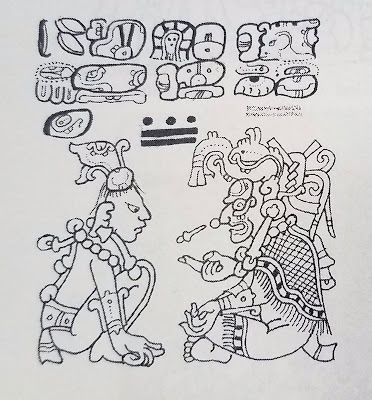 Teotihuacan is mentioned on an inscription from Palenque Temple V. Teotihuacan is mentioned on El Peru - Waka' Stela 15 8 days before Sihyaj K'ahk's fateful arrival in Tikal. Teotihuacan also shows up on Naachtun Stela 24 a few days before the Tikal conquest. Stucco and volcanic ash on pottery are Teotihuacan markers. After the Teotihuacan entrada there are evidences of a general peace between La Sufricaya, Holmul, El Zapote, Tikal, Uaxactun, Rio Azul, El Zotz, and Bejucal. Architecture becomes more grandiose. There is conformity, a single ceramic tradition. Dynasties form. Stela, altar complexes proliferate. 24 Glyphs became homogeneous, standardized. The peace evaporated ca. AD 530 when Teotihuacan was burned. Matilde Ivivc, Universidad del Valle de Guatemala. Indigenous healers were 25 herbalists. In many cases locals had better treatments for diseases than the Spaniards did. That is one reason Phillip V ordered the Florentine Codex written, to preserve native medicinal knowledge. Tomas Barrientos, Universidad del Valle de Guatemala. PLI was the largest LiDAR survey ever flown - over 2,000 square kilometers. LiDAR is the most revolutionary technology for archaeology in tropical forests since Carbon 14 dating was perfected in 1946. Technology began with the camera lucida used by Frederick Catherwood. It then progressed to the photographic camera and aerial photography. The Carnegie Institution employed Charles Lindbergh to take aerial photographs of the Maya area. It was Lindbergh who discovered Calakmul in 1930. 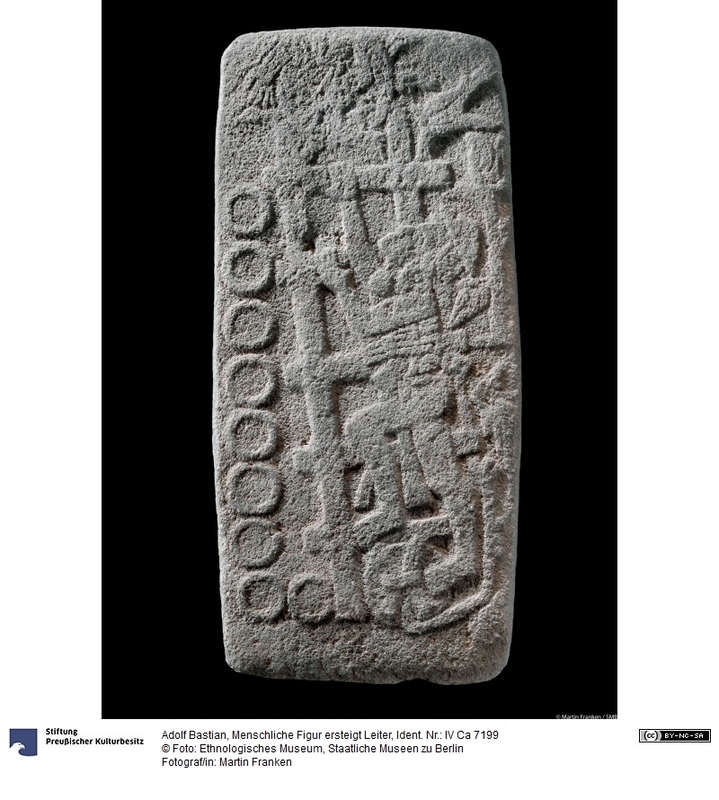 Technology progressed to include satellite imagery, GPS, and data bases of Maya inscriptions. Now we have 3D scanners for accurate imagery of a single carved monument and LiDAR for large scale mapping. 26 It was 1955 at Tikal before we knew the Maya built true cities with permanent populations rather than just ceremonial centers hosting seasonal pilgrimages. Tikal was the first Maya city with a complete map. It took 6 years of tedious work to complete. The PLI rendered a much better map of Tikal in 6 months. 27 Canals managed water. Terraced fields improved agricultural yields. The La Corona/El Achiotal survey showed 3,629 structures for an average density of 29 structures per square kilometer. Naachtun was 28 densest at 89 structures per square kilometer. El Peru - Waka' was next with 84 structures per square kilometer. 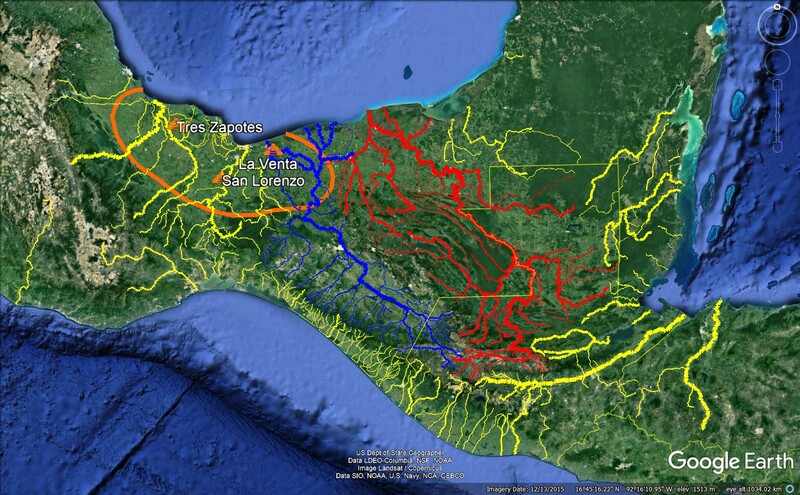 The central Maya lowlands encompass 23,000 square kilometers. 25% of Maya structures are non-residential. Residents per house mound (family size) averaged 4 - 5.6. 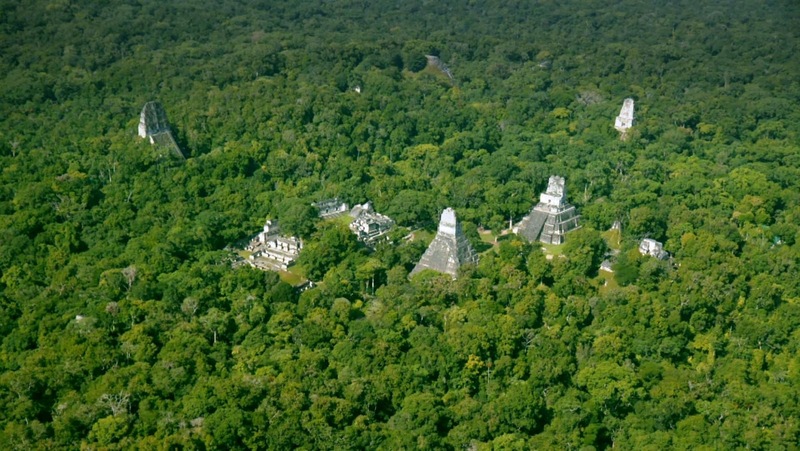 There are 95,000 square kilometers in the southern Maya lowlands. This means 2.7 million structures and 11 million inhabitants ca. AD 800. This is the math behind the numbers that so surprised the world when National Geographic reported them in February, 2018. The 29 Kaanul empire ca. 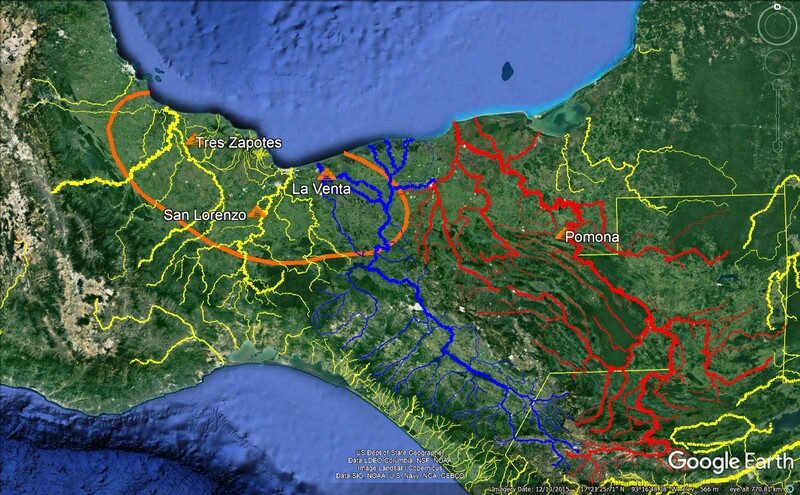 AD 690 stretched from Coba to Quirigua and from Palenque to the Caribbean. The Snake Kings ruled over 10 million people. Between AD 807 and AD 936 there were 8 major droughts in the southern Maya lowlands. This factored into the classic Maya collapse. Rather than focus on their failure at the end, though, we should focus on their 1,000 to 1,200 years of success. 30 The Maya were well-organized and they achieved sustainable productivity in a harsh environment. 31 They organized themselves in dozens of allied city states. Josephine Thompson, Foundation for Archaeological Research and Environmental Studies (FARES). 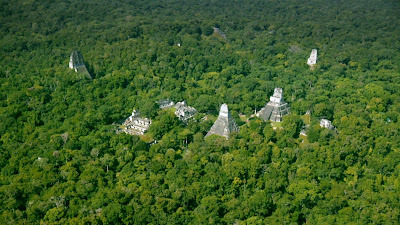 The Mirador/Calakmul Basin is 6,407 square kilometers. 10,000 square kilometers is ideal for a protected wilderness area. 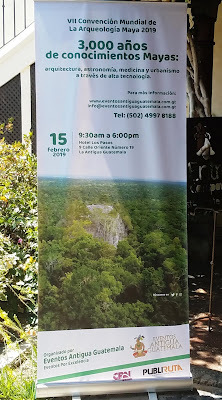 LiDAR surveys of the Mirador/Calakmul Basin were flown in 2018. Images are just now becoming available. Josephine had various LiDAR images posted outside the room for all to see. The new LiDAR surveys show 32 250 kilometers of sacbes (ancient highways) in part of the Mirador Basin. 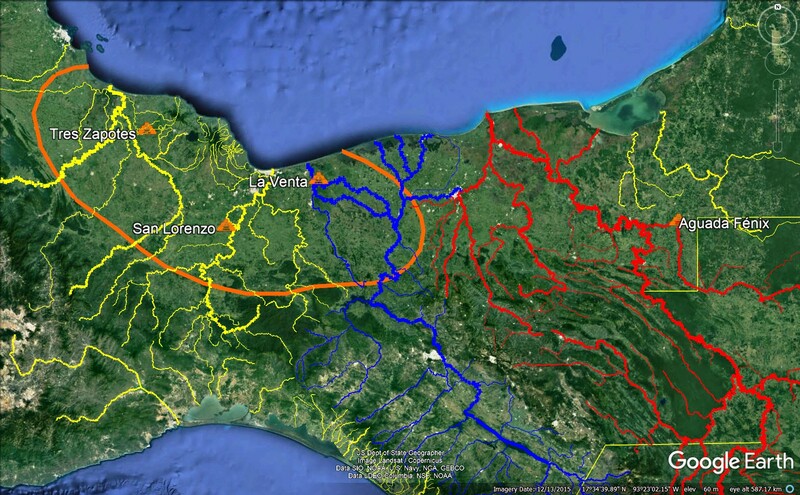 The longest discovered so far is a 25 kilometer causeway between Tintal and El Mirador. As a point of comparison, the Great Wall of China is 21,000 kilometers long. Josephine walked the causeway from Tintal to El Mirador. It took her 9 hours. She sees touristic potential. Wakna has the largest E Group in the world. The El Mirador archaeology program needs to raise $12,250,000 in the next five years or about $2.45 million per year. The project employs 400 people. Edgar Suyuc, FARES. El Mirador was discovered in the 1930's via aerial photography. In 1962 Ian Graham (1923 - 2017) drew the first site map. From 1979 - 1983 Ray Matheny (BYU) and Bruce Dahlin (1941 - 2011) (Catholic University) worked at the site. 33 Richard Hansen has been in charge since 1987 and work at El Mirador has flourished under his direction. The 34 largest structures in Mesoamerica were Pyramid of the Sun, Teotihuacan; Cholula; Templo Mayor, Tenochtitlan; El Tigre, El Mirador; Structure 1, Nakbe; Catzin, Tintal; Henequen, Tintal; Structure 2, Calakmul; Temple IV, Tikal; and the Great Pyramid, Toniná. All of them are dwarfed by La Danta. There is a causeway from the center of El Mirador to La Danta and another to Nakbe. La Danta is 72 meters high. It was 78 meters high at apogee. It is the tallest ancient structure in the New World and the largest ancient structure in antiquity. La Danta is east of the center of El Mirador. It was an E Group. It was built in 200 BC with large blocks of dressed stone. It featured a ceremonial pool of water. 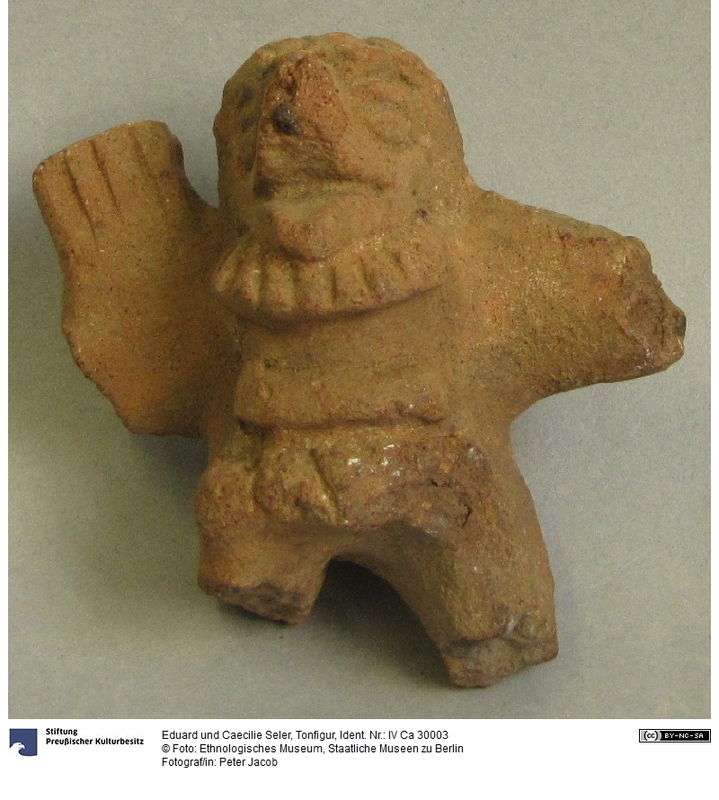 Lithics, ceramics, and figurines have been recovered from the excavation. La Danta required 15 million man days to construct. Richard Hansen, University of Utah. 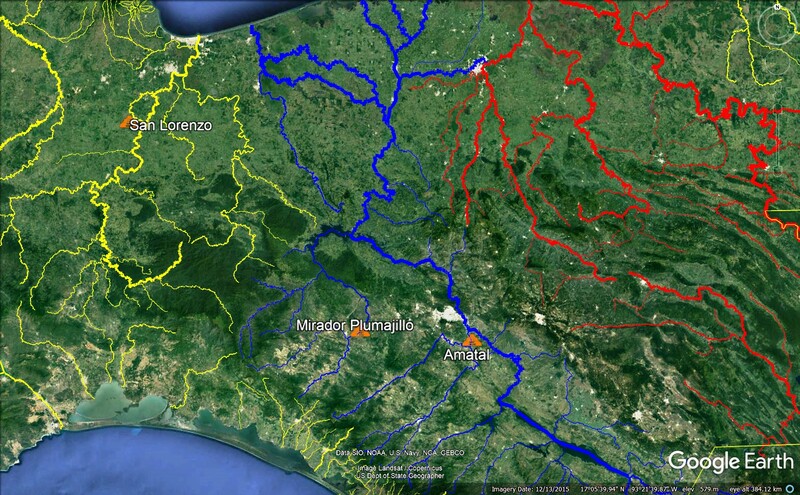 The Mirador/Calakmul Basin has a fault line to the west. The pyramids contain the greatest volume of building material of any structures in the ancient world. They are the tallest in the Americas. Tigre has a triadic pattern with 3 summits. This pattern was in place by 300 BC. El Mirador was abandoned AD 150. 35 A battle was fought on the steps of La Danta between AD 300 - 400. 100 locals were killed by Teotihuacanos. The obsidian points used in the battle came from Pachuca. Human blood stains some of the points. DNA extraction is being attempted. 36 A royal throne has been discovered along with pools of water. 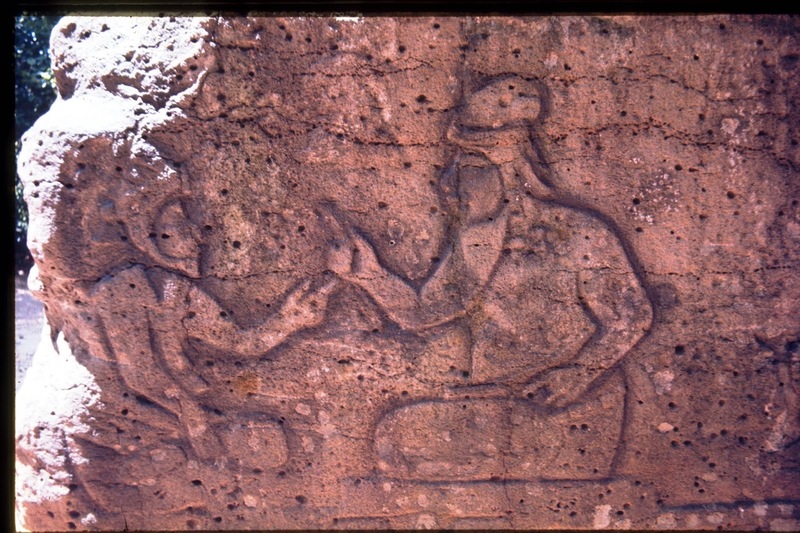 The stucco frieze at El Tigre shows 37 Hunahpu (one of the hero twins from the Popol Vuh) with a beard. The El Mirador excavations have uncovered walls and ceramics. 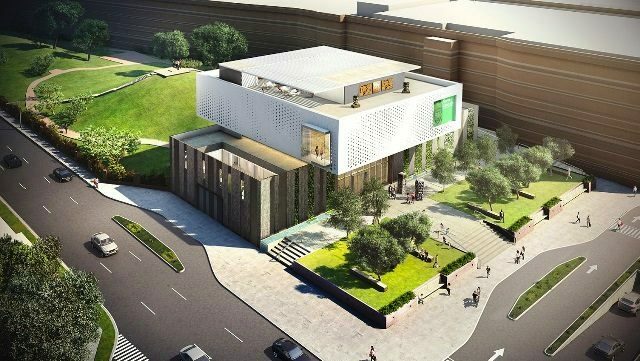 The Museo Mirador will open in Antigua in 2020. 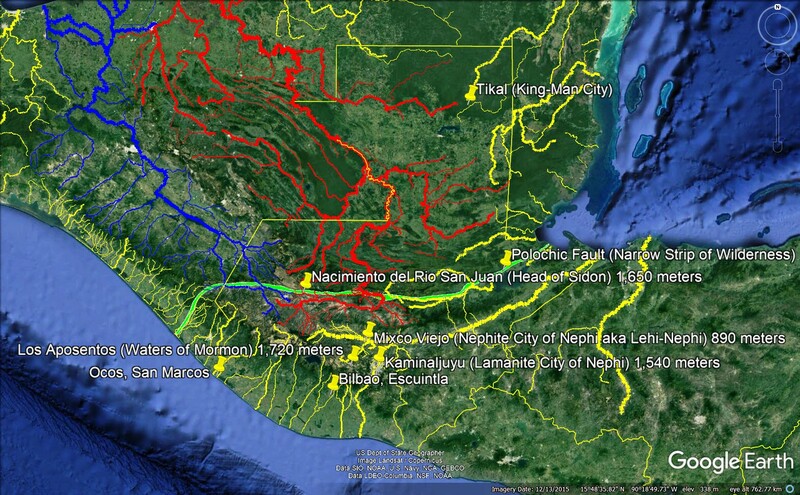 Early LiDAR initiatives in Mesoamerica included Izapa in 2013, Dzibanche, and Caracol. 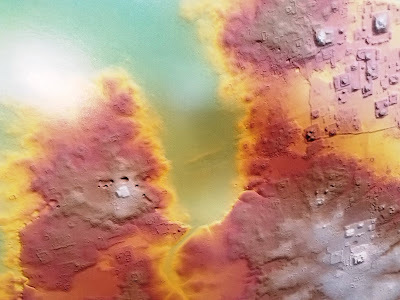 The current Mirador Basin LiDAR survey began in March, 2018 just after the PLI debuted. There was a plane crash. The pilot and technician both died. This tragedy slowed things down for a time, but work resumed and rendered LiDAR images are just now becoming available. Causeways up to 50 meters wide 38 radiate out from El Mirador east to La Danta, SE to Chacte, SSE to Nakbe, SW to Tintal, etc. To date 250 lineal kilometers of causeways have been discovered in the basin. They form a dendritic (branch and node) network. BYU soil scientist Richard Terry discovered systems of 39 meat production on an industrial scale. The ancient Maya were raising dogs and turtles for food. The largest Maya city was El Mirador. The second largest was Tintal. It had a ball court. Nakbe was larger than Tikal and it was built between 1,000 and 400 BC. Wakna was the first 40 state in the Americas. Maya society in the Mirador basin depended on 41 cotton, cacao, beans, and corn as staples. El Mirador flourished from 1,000 BC to AD 150. It was then re-occupied from AD 300 - 800. It participated in both the pre-classic and classic Maya collapses. Book of Mormon commentary on the 41 points. The Book of Mormon took place between ca. 2,500 BC and ca. AD 421. In Mesoamerican terminology, this is the pre-classic and early classic eras. 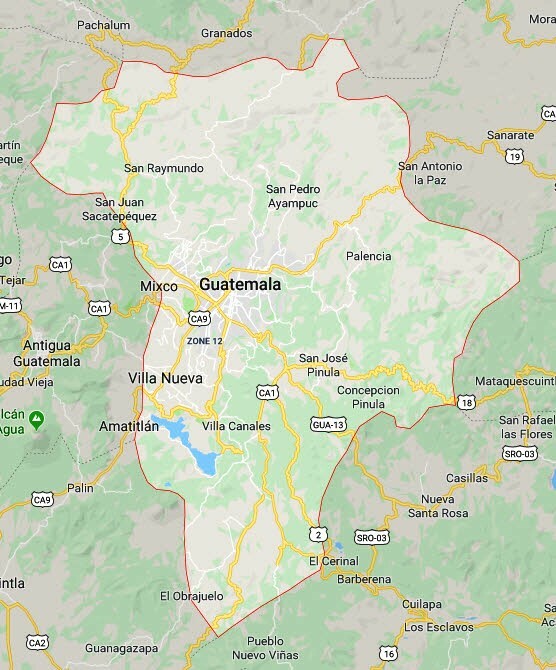 The fact that many of the ancient structures discovered in the Guatemalan Peten date to the pre-classic means they could potentially correlate with the Book of Mormon. El Palmar and Gran Cival date to Jaredite times. Mesoamericans in Book of Mormon times were astute observers of astronomical phenomena. Ditto the Nephites Helaman 12:15. Mesoamericans in Book of Mormon times used standard units of measurement. Ditto the Nephites Alma 11:5-19, Helaman 4:7. Mesoamericans in Book of Mormon times built roads. Ditto the Nephites 3 Nephi 8:13. 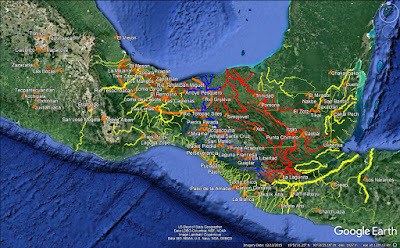 Many Mesoamerican sites collapsed ca. AD 200. Former peace gave way to territorial conflicts. This is precisely the time period when the peace following the Savior's visit began to fade as old ethnic and political divisions re-surfaced, eventually leading to conflict 4 Nephi 1:20, 26. Mesoamericans were erecting defensive walls in the early classic. Ditto the Nephites Mormon 2:4. Mesoamerican kingship was a well-established institution in Book of Mormon times. The Nephites had no end of trouble with dissenters who wanted to be kings Alma 47:8, 51:5. January 16, AD 378 was the day Teotihuacan militarily overthrew Tikal. Mormon at this time was leading the Nephites northward toward their final battle at hill Ramah/Cumorah Mormon 5:5. Mesoamericans built high defensive walls. Ditto the Nephites Alma 49:4. Mesoamericans built forts protected by walls and ditches or moats. Ditto the Nephites Alma 49:18. Mesoamericans fought with stones. Ditto the Nephites Alma 49:2. Mesoamericans built watchtowers. Ditto the Nephites Alma 50:4. More on fortifications is in the article "Ground-Truthed LiDAR." Mesoamericans fought bitter wars that ended in bloody sacrifices. Ditto the Lamanites Mormon 4:20-21. War brought a palpable sense of fear to the Maya landscape. This is almost a paraphrase of the Book of Mormon "great fear to come upon the people upon all the face of the land" Helaman 11:32. Mesoamericans ca. AD 500 experienced nearly constant war. Moroni described precisely this condition Mormon 8:8 just a few decades earlier. Long-distance trade declined when Teotihuacan collapsed. 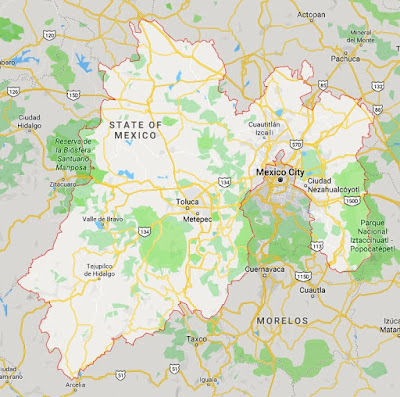 Teotihuacan may be the Gadianton capital established far into the land northward 3 Nephi 7:12. The Gadiantons were traders 4 Nephi 1:46. Mesoamericans recorded military actions in their histories. Ditto the Nephites Alma 43:3. The Book of Mormon is gradually being vindicated as authentic ancient history just as the Maya accounts of the Teotihuacan "entrada" were. Critics claim there is little material evidence for the Book of Mormon just as they did with the Teotihuacan "entrada." Critics claim Mormon wasn't really a historical military general just like they did with his contemporary, Sihyaj K'ahk'. Teotihuacan was on the rise shortly after 100 BC. Nephites were migrating into the land northward in large numbers at about this time Alma 63:4. Teotihuacan included many settlers from the south. Many people migrated northward from Zarahemla just as Teotihuacan was on the rise Helaman 3:3. Teotihuacan saw revolutionary changes ca. AD 300. Ditto the Nephites and Lamanites 4 Nephi 1:42-46. Teotihuacan was a commercial empire with a military component. Ditto the Gadiantons 3 Nephi 3:7-8. 30 kilometers is a typical day's march for a foot soldier. That is probably on the high end of what we would expect for a Nephite Helaman 4:7 since the term "a Nephite" in the text is always used in an ordinary rather than elite sense Alma 55:32. See the article "Land Southward Travel Times" for context. Prior to AD 378 Teotihuacan controlled Matacapan and Tres Zapotes in the Tuxtlas. Hill Ramah/Cumorah may be in the Tuxtlas and the Teotihuacan presence there could explain some things in the text such as the dual treaty in Mormon 2:8. Mayan glyphs underwent a process of standardization. Ditto Lamanite writing Mosiah 24:6-7. Mesoamericans cured diseases with herbs. Ditto the Nephites Alma 46:40. The Book of Mormon describes true cities Helaman 3:9. For over 100 years after Stephens and Catherwood introduced Maya civilization to the western world, archaeologists doubted the Maya built true cities. Finally, in 1955, enough work was done outside the ceremonial center that archaeologists realized Tikal was a true city. Mesoamericans built large scale public works. Ditto the Nephites Alma 53:3-4. The Book of Mormon describes high population densities Mormon 1:7. Science has now caught up. High population densities are attested in the Peten. The Book of Mormon describes absolute population numbers some have found hard to believe Ether 15:2. Science has now caught up. 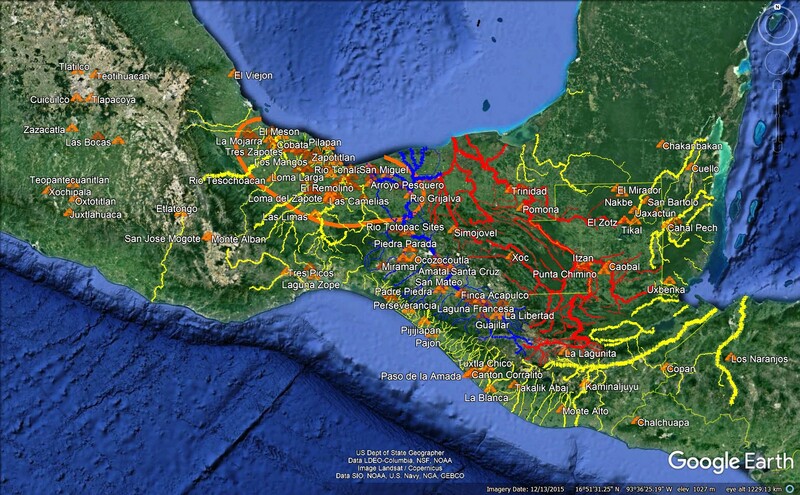 A single polity in ancient Mexico and Guatemala ruled over 10 million people. The Maya were well-organized. Ditto the Nephites 3 Nephi 6:11. The Maya lived in allied city-states. Ditto the Nephites Alma 50:14, 25. Mesoamericans in Book of Mormon times built many kilometers of highways. Ditto the Nephites Helaman 7:10. Richard Hansen is one of the world's great archaeologists. He is also a returned missionary (Bolivia) who loves the Book of Mormon, although he does not discuss it in professional settings. Mesoamericans built large structures. Ditto the Nephites Mosiah 11:12. Between AD 300 - 400, Teotihuacanos initiated a battle at El Mirador. In that same time period, Teotihuacanos may have participated in a much larger battle at hill Ramah/Cumorah Mormon 2:27, 8:9. The Book of Mormon mentions kings with thrones Ether 10:6. Royal thrones are attested at El Mirador in Book of Mormon times. The Book of Mormon describes populations that would have been bearded. Beards are attested in Mesoamerican art and iconography in Book of Mormon times. By European contact, the ability to grow a beard had largely disappeared from the native American gene pool. The Book of Mormon describes networks of roads linking cities and towns 3 Nephi 6:8. The Mirador Basin in Book of Mormon times had a dendritic network of roads linking cities. The Book of Mormon describes animal husbandry 3 Nephi 3:13. Science has now caught up. Domesticated meat production is attested in the Mirador Basin in Book of Mormon times. Mesoamerica had state level societies in Book of Mormon times. The Book of Mormon describes societies that advanced to state level Helaman 3:13-15, 7:22. See the article "State Level Societies." The Book of Mormon mentions corn Mosiah 7:22 and cloth Helaman 6:13. Maize and cotton were Mesoamerican agricultural staples. Kirk Magleby volunteers as Executive Director of Book of Mormon Central which builds enduring faith in Jesus Christ by making the Book of Mormon accessible, comprehensible, and defensible in English and Spanish.